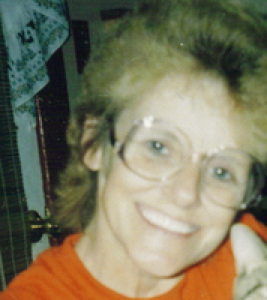 Kathryn Jane Woodall, 65, 1118 Fairmont Dr., Sidney, Ohio died at Ohio State University Medical Center, Columbus, Ohio on Thursday, May 14, 2009 at 9:28 PM of an extended illness. She was born April 26, 1944 in Sidney, Ohio the daughter of Raymond and Leona (Ely) Hendricks and they are deceased. She is survived by her best friend, Norman Shade of Sidney and two children, Nancy R. Sigley of Defiance, Ohio and Michael T. Woodall and wife Lisa of Ava, Missouri and four grandchildren, Sophie Rose Sigley, Corey Woodall, Kailee Woodall, and Brendon Woodall and one one sister Nancy Lane and husband Robert of Wapakoneta, Ohio. Three sons, Jeffrey, Todd and Daniel Woodall and three brothers, Roger, Robert and Marion Lee Hendricks are deceased. She was a past member of the Sidney Eagles and loved to crochet, cook and play solitaire on the computer. She was a homemaker. There is no visitation and private memorial services will be held at a later date. Memorial contributions may be made to the Ohio State University Medical Center, 410 W. 10th Ave., Columbus, Ohio 43210. Attention: SCIU Department in memory of Kathryn Jane Woodall. Salm-McGill and Tangeman Funeral Home in Sidney is handling the funeral arrangements.